The novel tells of a search of an unexplored region of Africa by a group of adventurers led by Allan Quatermain for the missing brother of one of the party. The men find danger, hardship, myth, lost tribes, cruel kings, and evil sorceress, and overcome all. 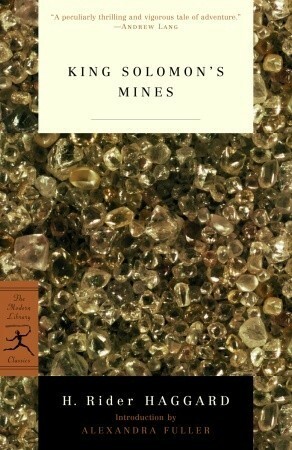 Through a series of adventures the men escape near-certain death, with pocketfuls of diamonds from “King Solomon’s Mines”, enough to make them rich for life. It is the first English adventure novel set in Africa, and is considered to be the genesis of the Lost World literary genre. This is the first book in what was to be a long running and prolific series. I scored this book on a cheap Audible deal and could not pass it up. The Kindle book is free and there’s that lovely Whispersync technology for an immersive reading experience that I love, especially when playing Road Warrior. Why should I ever put a book down if i can go straight from reading to audio? Especially when that book is as engaging a living text as this? No wonder I saw the movie about 1000 times as a kid! My parents loved Allan Quartermain. If I read this book as a youth, I’ve utterly forgotten it. Warning, this is a 19th Century book. There are words considered uncouth today as well as interesting uses of other words. That said: I loved the adventure and the camaraderie between the black Africans and the white explorers. Would they indeed find King Solomon’s Mine? Riches beyond imagine? And more importantly, would they live to tell the tale? We don’t get as much exploration today as we’ve mapped so much of our world. It is fantastic to dip into a world where less is known and one can perceive treasures and adventure beyond imagine around every corner. I’ve slated the second book, also an audio/kindle duo, for later this year because I loved this first one!